Right, now what can I tell you about Pasja? Pasja is a real fighter. He began his fighting career with his little brother Puji. Later he fought with all the other cockerels. And they were not all small. Unfortunately,Pasja however didn't escape all these fights unhurt. His right eye got damaged and his eyesight is poor. 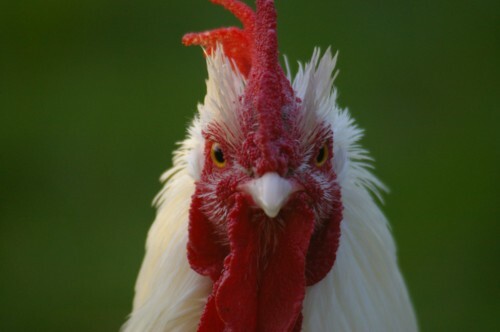 A chicken can cope very well with only one eye. It's a different story when they damage the other eye too. And that's what happened to Pasja. 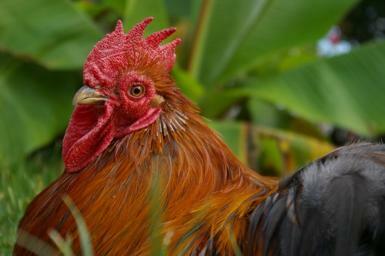 Too full of confidence, he began to fight with a younger cockerel. We found him defeated in the grass. He was not injured apart from his eye that he kept closed. Worried, we went with him to the vet. What can you do with a blind cockerel? Using a contrast fluid, it was possible to see that the damage was restricted to a scratch on his eye. Relieved we went home with some antibiotic cream. It was applied daily and after a few days Pasja was able to see again. Now he spends his days with his girlfriend Snowy. He is a very attentive cockerel, as he shows her the grains in the grass. Pasja is a Cochin bantam. Our passion for chickens started on an Autumn day in 2003. Our neighbours received a new load of industrial chicks to be raised for meat. These had to be unloaded and we offered to help. So there we were, armed with clean boots and strong gloves. The lorry came and the first boxes were removed with a small fork lift truck. What happened next was fatal for a large number of chicks. A box fell from the fork lift truck and the contents lay scattered on the ground. All but 6 of the chicks were dead. The survivors couldn’t go into the barn because they were considered contaminated. Yes, you’ve guessed it already. While my husband helped further with the unloading, I hurried back to the house with the 6 chicks in my arms. In the barn we had an old birdcage which I put them in. Unfortunately only one survived, a little cockerel. As a cockerel by itself is not happy, our neighbour came that evening with a young lady chick. We named them Chucky and Lucky. Soon afterwards we bought a pair of pekin bantams, Frizzy and Lizzy. What you see here is one of Chucky and Lizzy’s offspring. Pure bred or not, Rocky was a splendid cockerel! Snow white with little feathers on his legs. Rocky died just before Christmas 2009. Rocky is a Cochin bantam/industrial cross. Ned hasn't been with us for very long. He and his brother Kelly hatched under our white hen Rusty. When they were still young they established who was boss. They share equally a group of 6 hens. When Ned mounts a hen Kelly soon follows and vise versa. 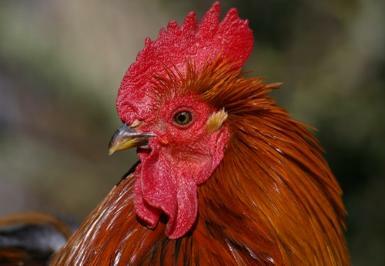 Ned is a Cochin bantam.